The best way to know for sure what products or programs are right for you, is to do testing with your healthcare professional. Testing takes the guesswork out of caring for your health. The results provide the additional tools necessary to develop and individualized plan for your care. Below are some of the more common tests your provider may recommend. - Exfoliates and rejuvenates healthy skin cells for long lasting, youthful looking skin. 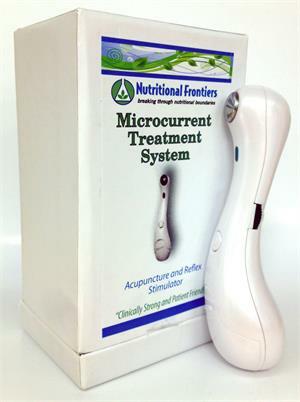 - Fast relief, results in just one or two minutes. - Not just pain control, helps to balance and heal body too. - Works great for headaches, neck pain and tension, and low back pain. - Results the first time you use the system. - Great for Sports activities. Provides relief from strains, sprains, and muscle trauma from injuries. Glucose is a simple sugar that serves as the main source of energy for the body. Most of the body’s cells require glucose for energy production; brain and nervous system cells can function only when glucose levels in the blood remain within a narrow range. The blood test for glucose is used to screen for diabetes, prediabetes and hypoglycemia (low blood sugar). Sodium is an electrolyte present in all body fluids. It works to keep sufficient water in the body and also to control blood pressure. The blood test for sodium is used to detect the cause of dehydration, edema (swelling) or a variety of other conditions. The test is also used to help monitor treatments for these conditions. Potassium is an electrolyte that is located primarily inside the cells of the body. Potassium is important for muscle and nerve function. Elevated potassium levels (hyperkalemia) may indicate kidney disease. Low levels of potassium (hypokalemia) may result from diuretics (water pills), vomiting or diarrhea. Calcium is one of the most important minerals in the body. About 99% of the body’s calcium is found in teeth and bones, and the rest circulates in the blood. Blood calcium is used to monitor a range of conditions related to bones, teeth, nerves, muscles, heart and kidneys. About half of the body’s calcium is bound by albumin. Therefore, calcium levels are interpreted in combination with albumin levels. Elevation of blood calcium levels can occur with bone and metabolic diseases. Some medications may also cause high calcium levels. Low levels may be the result of metabolic of kidney disorders, vitamin D deficiencies or malabsorption of calcium from the intestines. Magnesium is a mineral found in every cell of the body. It is vital to energy production, muscle contraction, nerve function and strong bones. Magnesium plays a vital role in the absorption and metabolism of calcium. Magnesium levels may be used to assess kidney problems, uncontrolled diabetes and gastrointestinal problems. Phosphorus is vital for energy production, muscle and nerve function and bone growth. It also acts as a buffer to help maintain the acid-base balance in the body. Phosphorus testing can help diagnose and evaluate conditions and diseases that effect the gastrointestinal tract. Testing also can diagnose disorders that effect the kidneys. Creatinine is produced in the muscles when a compound called creatine spontaneously breaks down. The kidneys excrete creatinine, so blood levels are a good measure of how well the kidneys are working. Elevations can indicate kidney disease. BUN is a waste product in the blood that is eliminated through the kidneys. BUN levels are interpreted in conjunction with creatinine levels to monitor kidney function. BUN levels also may be elevated because of dehydration or blood in the gastrointestinal tract. Low BUN levels may be seen with liver disease or malnutrition. Cholesterol is a lipid (fatty substance) that is essential for life. It forms the membranes for cells in all organs and tissues in the body. A small amount of the body’s cholesterol circulates in the blood in complex particles called lipoproteins. Measurement of blood cholesterol levels is used to estimate the risk of developing heart disease. cholesterol because it removes excess cholesterol and LDL (“bad” cholesterol) from the arteries. The higher the HDL, the better. Low levels of HDL are associated with increased risk of heart disease. LDL Cholesterol: LDL is a type of lipoprotein that carries cholesterol in the blood. It is considered to be undesirable because it deposits excess cholesterol in walls of blood vessels and contributes to hardening of the arteries. LDL is known as the “bad” cholesterol. High LDL levels are associated with a higher risk for heart disease. Fat is stored in the body in the form of triglycerides. Some triglycerides circulate in the blood and serve to provide fuel for the muscles to work. Blood tests for triglycerides are used to identify the risk of developing heart disease. Triglyceride levels in the blood may be high if you did not fast at least 12 hours prior to testing. The total protein test roughly measures all of the proteins in the plasma portion of the blood. Proteins are important building blocks of all cells and tissues and are important for body growth and health. Total protein can provide general information about nutritional status. It is ordered along with several other tests if there are symptoms that suggest liver or kidney disorders. Albumin is the most aboundant protein in blood plasma. Increased albumin levels may indicate dehydration. Low levels may occur in malnutrition and some chronic diseases. Albumin-Globulin Ratio The A-G ratio is the albumin (A) laboratory value divided by the globulin (G) value. A low A-G ratio can indicate infection, inflammation or problems with the liver or kidneys. Bilirubin is formed when hemoglobin (particles of the blood) breaks down. Small amounts of bilirubin are present in blood from damaged or old red blood cells that have died. High levels of bilirubin can cause a condition called jaundice (a yellowing of the skin and the whites of the eyes). Further testing is needed to determine the cause. Too much bilirubin may mean too many red blood cells are being destroyed or that the liver is incapable of removing bilirubin from the blood. Alkaline phosphatase is an enzyme found mostly in the liver. Smaller amounts are in the kidneys, heart, and muscles. Elevations in alkaline phosphate may indicate liver or bone disease. Lactic dehydrogenase is an enzyme that is found in almost all body tissues. Any damaged tissue can leak LDH into the blood, causing an elevated value. When cells are damaged or destroyed, they release LDH into the bloodstream, causing blood levels to rise. For this reason, LDH is used as a general indicator of injury to cells. Small elevations in LDH are usually not significant when other enzyme levels are normal. GGT is an enzyme found mainly in the liver. It is sensitive to changes in liver function. Low levels are normally present in the blood. Elevations can occur in all types of liver disease, and with the consumption of alcohol and some medications. GGT is the most sensitive liver enzyme in detecting bile duct problems. However, it can be elevated even without bile duct problems if someone is overweight or has fat in the liver. AST is an enzyme found mostly in the heart and liver. When liver or muscle cells are injured, they release AST into the blood. It also may be released from red blood cells if those cells are damaged when blood is being drawn. ALT is an enzyme found mostly in the liver. When the liver is damaged, ALT is released into the bloodstream. Uric acid is a product of cell metabolism in the body and is excreted mainly by the kidneys. Excess uric acid can cause the condition called gout. This can be a result of overproduction of uric acid or a decreased ability of the kidneys to secrete uric acid. Iron is needed to help form adequate numbers of normal red blood cells that carry oxygen throughout the body. Iron is a critical part of hemoglobin, the protein in red blood cells that binds oxygen. Low iron levels can lead to iron deficiency anemia. Increased levels can lead to excess storage in the body’s organs and can result in a condition called hemochromatosis. A white blood cell count indicates the number of white blood cells in a sample of blood. WBCs play an important role in fighting infection and may be a sign of inflammation. If an infection develops, white blood cells attack and destroy the bacteria, fungus or virus causing the infection. Red blood cells carry oxygen from the lungs to the cells and transport carbon dioxide (a normal cell waste product) from the cells to the lungs. High RBCs (polycythemia) may indicate dehydration. A low count may indicate anemia. Hemoglobin, a protein found in red blood cells, is the actual oxygen-carrying component of red blood cells. If hemoglobin levels are low, you may have anemia, a condition in which there is less blood to deliver oxygen to your body’s tissues. Hematocrit is a measurement of the proportion of blood that is made up of red blood cells. Red blood cells are, on average, 45% of the body’s total volume. Hematocrit levels may be high with dehydration. Low hematocrit levels may indicate anemia. Your nails may reveal clues to your overall health. Ridges, rings, bumps and discolorations may be a sign of disease in the body. Problems in the liver, lungs, and heart can show up as changes in your nails. The following tips may help you to learn what secrets your nails might reveal. Moons (or lunulae) are lighter colored half circles located at the nail bed. A person with a healthy thyroid have a moon on each finger. The more moons that are reduced in size or missing, the more weak the thyroid. Weak thyroid can cause fatigue, mood swings, weight gain, depression, thinning of hair or change in hair texture and skin. Vertical ridges run the length of the nail, from the moon out to the tip. Conditions associated with vertical ridges include arthritis and possible iron deficiency. This is where the tip of each nail has a dark band. Sometimes this can be attributed to aging. In other cases, it can be a sign of a serious underlying condition such as liver disease. The shape of the nail itself is not deformed, but does not properly grow outward towards the sides of the fingers. This can indicate bone or skeletal problems. A noticeable “V” shape of the nail coming outward from the nail bed. Most commonly associated with rheumatoid arthritis. Indented nails is where small depressions are visible in the nails. They are most common in people who have fungal or tinea infections. This is a type of spooning where the end of the nail tends to “hook” over the finger. It is sometimes the result of low oxygen in the blood and could be a sign of various types of respiratory problems. Spoon-like are soft nails that look scooped out. The depression usually is large enough to hold a drop of liquid. Often, spoon nails are a sign of thyroid disorder or possible anemia. When the nail grows out toward the sides of the finger, more than in length, this is referred to as a “Short / Wide” nail. Talk to your healthcare professional about possible infertility. Repetitive, raised or bumpy dots are present on the nail surface with this condition. In many cases it is an indication of arthritis or rheumatoid arthritis. Horizontal ridges run the with of the nail and can be of varying depth. They can be simply a deficiency of calcium or vitamins A or B complex, but in some cases can more serious and indicate poor kidney function or major illness requiring the attention of a healthcare professional. This is where a mixture of dark lines and small splotchy patches are noticeable. When this is present, consult a qualified healthcare professional to check for liver problems, gastritis or intestinal / internal bleeding. With these tones, nails can thicken and new growth slows, resulting in a discoloration. Usually indicates a digestive problem. These can be few or many, but when red circular spots are visible it is usually a sign of chronic gastritis. With this condition, the fingernails become loose and can separate from the nail bed. Sometimes detached nails are associated with injury or infection, but should be checked by a healthcare practitioner to rule out an autoimmune condition. Dry, brittle nails that frequently crack or break have been linked to thyroid disease. If the nail surface is rippled with multiple splits at the ends, this may be an early sign of an adrenal problem. A soft tissue growth like this can be an indication of a thyroid problem. A hangnail is a small, torn piece of skin next to the fingernail. It indicates poor digestion, lack of dietary protein or a Vitamin C deficiency. Contact your Health Care Professional for information on nutritional support for these conditions. A vertical line in front of the nub near the ear hole may indicate a heart problem or high blood pressure. A horizontal line on the earlobe can suggest diabetic problems. Bags under the eyes, a condition that is becoming increasingly common, can indicate kidney weakness. Deep, vertical lines between the eyes: tension, anger, nervousness and/ or liver problems. This test is an excellent way to determine thyroid function using basal body temperature (the body’s temperature at rest). If the thyroid is running low, the body’s temperature will drop below normal while the body is at rest-sleep. This test is done by measuring the underarm temperature upon waking after a night’s sleep. For accuracy, the test is performed five mornings in a row and then the mean average is calculated. The night before, shake down the thermometer and set it on the night stand next to the bed. The test is invalidated if you expend any energy just before recording the temperature, i.e. getting up for any reason, shaking down the thermometer, etc. A mean average temperature of between 97.8 and 98.2 degrees is considered normal.